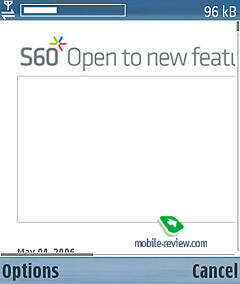 Devices running off S60 3dEditionFeaturePack 1 utilize OSS-browser ver. 2.0, which retains a whole lot of differences from the first edition, so this is why we are now extending the article with some new chapters. If this is the first time you read this review, then you should start with the very beginning, in case you have already looked through it or have a good idea what the first version was, then move on straight to the close-up of the second version. Till recently Nokia was dealing only with one major browser-supplier, namely Opera, which armed most of the smartphones with its products. 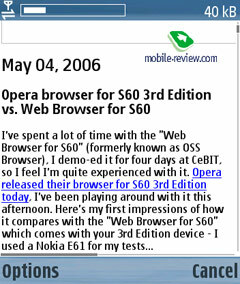 Yet once Nseries stepped into limelight, Nokia set the goal to develop and integrate an application of its own, so that it could outdo Opera’s one. To make the task easier to accomplish, Nokia simply turned to available to all codes of open-source resources and compiled their solution basing off them. The engine of the final version is almost alike that found Apple Safari Browser, though there are several more components used there. 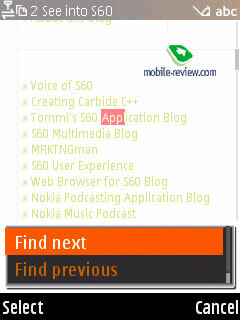 Over at Nokia they decided to embed API browser management, connect a couple of additional modules, re-work the interface and merge it with download manager, which is in fact a part of the any operating system used. 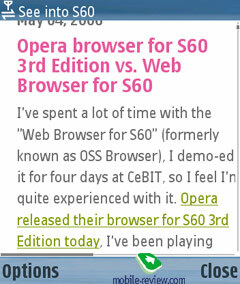 The given browser is enabled only for handsets running Symbian 9, in other words powered by S60 3ed edition. 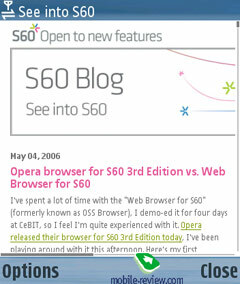 Several models feature this app as a pre-installed one, for example the N80, on some you will find a default S60 browser with a possibility to replace it with OSS Browser (it’s the old title, used for distinguishing from the standard browser). Functionality-wise the OSS Browser leaves the default one far behind – so let us look into what makes it so supreme. 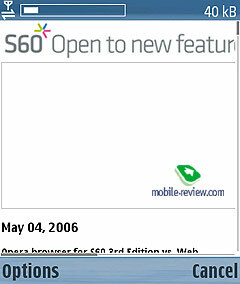 But before doing so, I shall clear up the terminology for you: for the time being, all Symbian 9 S60 handsets incorporate OSS by default, which is specially marked in order to discern that installed on earlier models from the new one. In future exactly this app is going to receive all patches and consequentially reserved space on all upcoming S60-powered handsets. 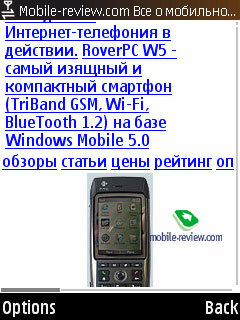 Type of language package is dependent on firmware found on the handset, rather than browser’s version – our unit supported all Russian codings. The thing with languages is very essential, since in European supplies there will be Russian language support anyhow, even if there is no translated interface. At the same time models with point of destination the US or Asia may not carry Russian language support (or, basically, so other languages as well). Screen resolution does not make any sense for the browser – it is readily manageable on those display featuring 176x208, 320x240 or 352x416 pixels. 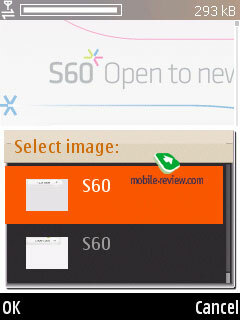 The company stresses that the app is adjustable to almost any screen size – e.g to 208x208 found on the 5500. Landscape mode is also enabled, but its availability varies from one handset to another – in case the phone allows going for horizontal mode, the browser will correspondingly turn this option on. 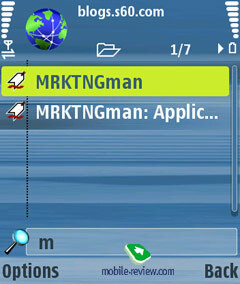 Manual management of landscape mode is not provided at present in the application. Connections. In settings there are special fields for home page, connection type and particular connection profile. Apart from widely-applied GPRS-WAP, GRPS-Internet, 3G, there are also WLAN (WiFi-connection if the handset carries proper connectivity). Connection time is the only drawback of the system – in case of WiFi the browser will look up for additional networks available, and on top of that at startup the app requires connection confirmation. время доступа. Bookmarks. 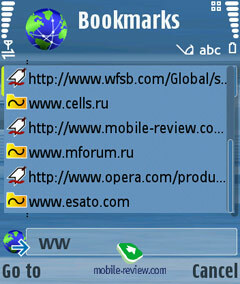 Generally a handset is capable of storing unlimited amount of bookmarks, which seem to be capped only to available storage size. 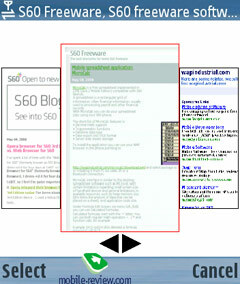 Each bookmark possesses its own title, displayed on the entry-list, which may contain not more than 50 symbols, while the page’s address length, which it is bound up with, cannot exceed 255 chars (even though the browser handles urls up to 2048 symbols long, it cannot make a bookmark for them). 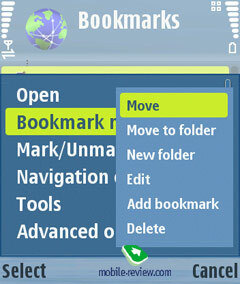 Bookmark manager stands for creating folders, moving back and forth between them and editing already existing bookmarks. Similarly to other Nokia’s products, here you won’t be able to mark only certain entries – the present way of managing the list is quite laborious, so here is a piece of good advice – don’t neglect your bookmarks collection. Another flaw is the absence of archiving function – actually there is the capability of making an archive of all the data stored on the handset but without singling out bookmarks. 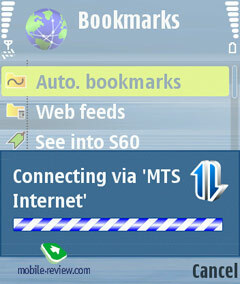 Any bookmark may be sent as an SMS to other devices, although the app won’t let you insert your favorite links to a MMS or e-mail letter. 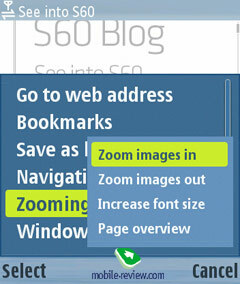 Auto-bookmarks (also adaptive bookmarks) – on visiting a web-page the browser automatically memorizes its address and moves to a special list, stored in Bookmarks section. All pages referring to a particular resource are saved in a separated folder, so opening it will reveal visiting history. The general list of adoptive bookmarks is sorted by visiting frequency; this means more popular pages are placed on the top. One more thing of note is that the list includes not only manually-typed links, but also those you visited using hyperlinks. And should an error occur during the session with the application being terminated, not a single auto-bookmark is going to be saved, since the browser memorizes them only on normal shut downs. Split-screen interface. The browser supports up to 5 simultaneously opened windows, which can be switched between though the context menu or by pressing “5” for bringing up a full list of currently opened windows. Nevertheless you can’t just open up a new link in a new window and what is more, there are only a few links which start up in a new window, so this is a felt drawback. Each window has its own unique clickstream record. Via settings you can block pop-ups, a fetching function letting you save some traffic by skipping unwanted ads. Navigation, zooming. 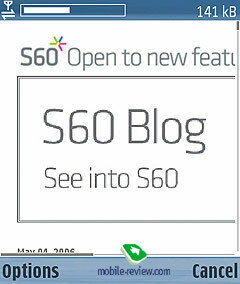 The browser’s very own exceptional function is ability to view minimized pages in so called mini-map mode, so that having loaded the page the browser can show what place you are on (press 8) – on top of minimized page window you will se a red-bordered rectangle displaying your position. By moving navigation pad or joystick you can quickly browse through the page and if the mini-map isn’t on, it will appear automatically. Pages thumbnails are used for lining up visual clickstream of each open window. Pressing Back calls up list of all viewed resources over the current session. Those who are in need of a spartan list of page will find this option here as well. Against the background of nice improvements, the History has obtained a serious disadvantage as well – if you go back to the previous page, the browser will automatically initiate loading of page’s contents. Cache usage settings cannot be altered in this browser and this proves to be a major drawback ending up by causing extra traffic-expenses for you. With a view to somehow save the megs, you can turn image upload off, but it doesn’t make much of a difference. 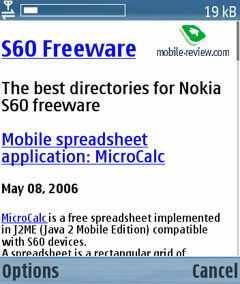 Nokia emphasizes that this browser displays web-pages exactly in the same manner as any desktop PC does, and thus this apps turns out to be quite appealing. But it would be naive to think that no optimization for better fitting has taken place. It’s official that the browser applies simultaneous scaling of both text and images, though we had no luck with finding algorithms, determining image and text processing, in other words we don’t know how it pick the most suitable size. From my observation it seemed that algorithm is quite intellectual, for most pages from different web-sites a special mode is picked so that main information block would fit the screen. 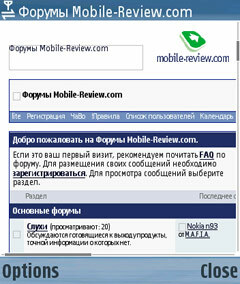 For example at Mobile-Review.com ewe have navigation block on the left, and news feed on the right. This means that important information for reader is stored right in the middle. 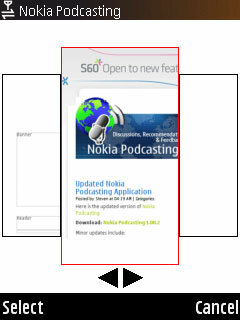 This is the block that browser is using for scaling, you can see that on our Nokia N80. This approach allows reading articles without using horizontal scroll, which is convenient. This algorithm is also the cause of the fact that when a page is loading all information can simply vanish (here’s the white screen with loading bar on top, and that’s it), later on you will see everything in different scale. In case user will try scrolling the page during that moment, it would be logical to suppose that page map would appear after button is pressed in any direction. Considering the fact that the page is not yet loaded by 1/4 , map is not able to display the content. In best case you will see white page that would represent mini-map, in worst – browser will crash and you will have to enter everything from start. Abnormal browser crashes depend mostly on type of viewed pages. Pages can be zoomed by 50, 75, 100 and 125 percent. Browser stores last setting within 1 session. Switching between zoom does not affect browser’s operating speed, and it takes less than two seconds even on big pages. In settings you can select weather scaling will be applied only for text or only for photos, in both directions – scaling up and down. Unfortunately you will not see current setting and maximal one. User can remove status messages for buttons, this mode is called fullscreen. You can use cursor for navigation, with its help you can select links, text fields (like for search engines), or drop down menus. 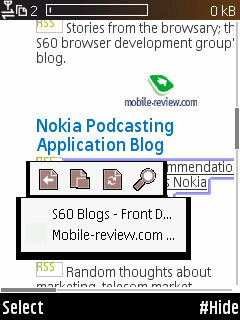 One of disadvantages of this navigation way is inability to select small links in several types of forums, for example when after another link there are hyperlinks to page numbers (from 2 to 30, for example) Nokia Web Browser simply skips them. Cursor’s step is bigger than size of links on screen. You will have to slightly scroll cursor around links, until you hit the right one, another solution is changing zoom, but this is not that interesting, is it? As for navigation, cursor promises to be more interesting than anything we seen before. 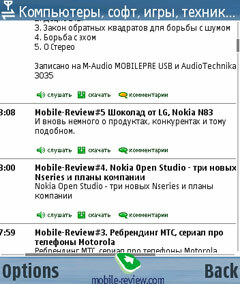 Concept of this navigation is well-tested on Series 90 platform, including Nokia’s communicators. When you enter address auto matching is used, it suggests web-sites that you entered before. Automatic matching or suffixes and prefixes does not exist. Browser supports cookie, this allows identification on several sites, forums, prevents you from entering passwords over and over again. On other hand, those sites that don’t support cookies will force you to do so, since browser is not storing your passwords. Text search. Browser has built-in text search function on opened page. You just have to start typing the word and you will see automatic scroll of page until this word has been mentioned for the first time. When you press A – you will head to first A letter on the page. 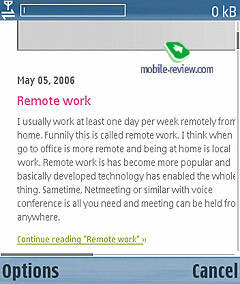 Search works fast and without any annoyances, vertical scrolling allows searching for next word in the text (by the way – it gets highlighted in the text). C – Close current tab or all. Download manager. 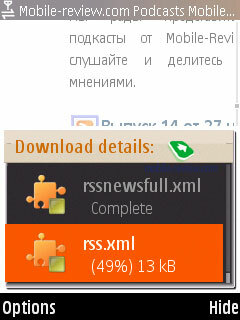 On the whole Download Manager is related more to OS itself than the browser, although developers created access to that one. Once you click a link that is leading to a file in browser’s window, system will recognize file type. In case this is an application, after file has been downloaded – installation will begin automatically, in case this is multimedia file – different options are possible. You can play file with default apps, or save it in phone’s memory. 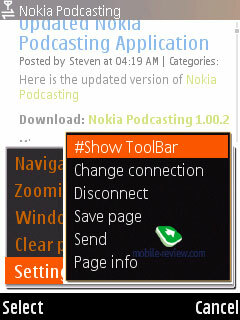 Several simultaneous downloads are supported, they can be made in background mode, and that’s a big advantage. Downloads can be resumed from the moment they were paused (server has to support this option). 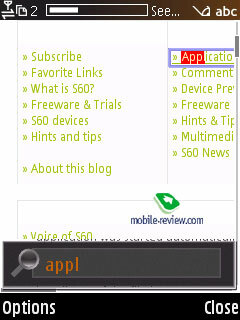 As for disadvantages, you cannot see list of downloads from browser’s windows, there’s no such function. Exiting browser will stop all current downloads, and once you open browser again you will not see a message that files were downloaded successful (but they will actually be stored, you just won’t be notified about that). In order to see all downloaded files – start a new one. 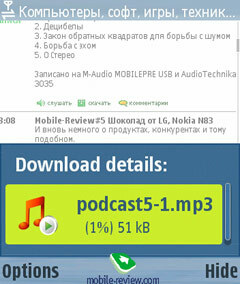 Integration of download manager in browser is essential, especially on new devices, here are a lot of improvements. Web Feeds. 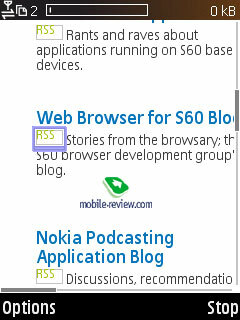 Browser supports RSS-feeds, on a page with that link you can click on an icon and it will be added to Web Feeds. 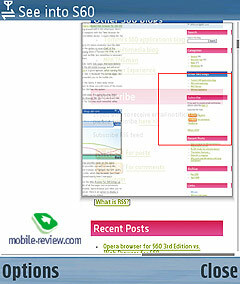 This folder which is placed second in the Bookmarks list right after Auto.bookmarks. 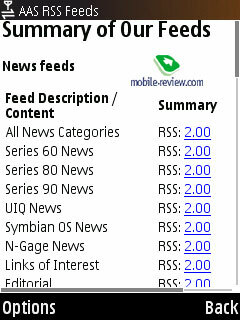 You can subscribe to RSS feeds or cancel that thing, since right after they were clicked on, they are added. 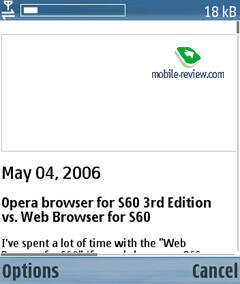 When this review was written, Web Feeds version was 3.0. The development speed of the browser’s new edition is truly formidable – 8 months after the initial release we get a revamped application sporting a number of improvements that are of vital importance for most users. OSSBrowser 2.0 comes included only with smartphones having 3rd edition Feature Pack 1 onboard, and the fact of the matter is, this is an all-in-one application, meaning that two different programs setup is no more. But keep in mind that there is no way to install it on previous models (for example on the basic 3rd edition), but it is not the maker’s omission – on the contrary, he has deliberately left out prior software versions in order to reduce the development time and avoid bothering about compatibility issues. No doubt, the end-users don’t really like this way, but there is a little they can do about it. 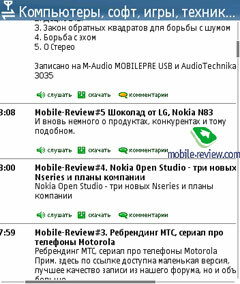 If you want to find out what they think – go to Nokia blog and look no further, as people are unanimous over there. WAP. 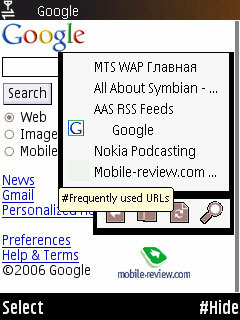 The first version of the browser didn’t feature support for surfing wap-resources, so that you had nothing to do but go for a built-in browser, yet now things are different, as the second edition of OSS-browser is equipped with all protocols and there is no need in swapping applications just to find what you want on the Net. Frequently used links – list of text-links to the lately-visited resources, remains “alive” not only during one session, since even after closing the app, it won’t disappear. Mini-map – no need to use a shortcut or scroll through a page to bring up a mini-map, which is very handy. Refresh – reloads current page. 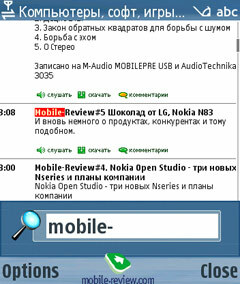 Search – enables looking up for a word or a phrase within a page. While typing, the app doesn’t sit on its hands and highlights the first word matching the submitted criterion. However you will have a hard time searching for other fitting words – to do that you will have to go into a menu and pick there “Find Next/Previous” item; this aspect is definitely cries out to be improved by binding up a shortcut to a numeric key, for example. Standard search can be carried out by e-mail address, text and phone numbers. Another good thing about the updated version of the OSS browser is that from now on all links found in the text or images with attached links are marked not only with Italic font, but with a frame edging them as well, which is convenient. Open link in a new window. 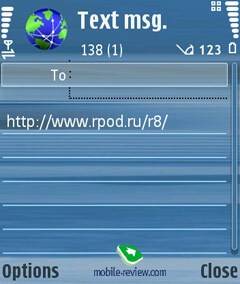 The user is not able to open a couple of windows at once, but following the links can be carried out via the menu, so that it becomes possible to open links in new windows. Undoubtedly, this is what many have wanted to get for multi-page navigation. 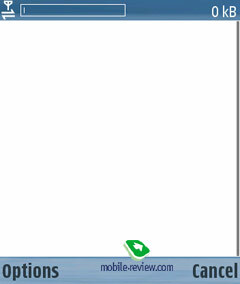 Switching between windows can be done by pressing “5” or picking a corresponding item in the menu. 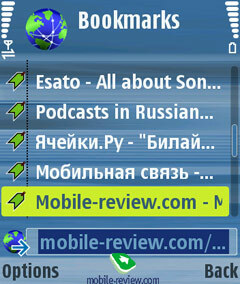 The top of the screen gets filled up with tabs, which can be navigated through by leaning the navigation key horizontally. 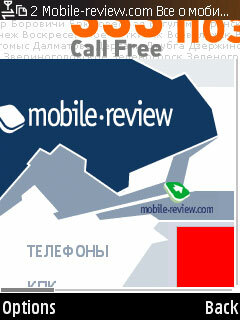 Rotate display. Similarly to Eseries models, where this feature is enabled in all applications, the OSS browser now boasts landscape-mode, meaning that a picture goes into horizontally-orientated mode from the vertical layout. This feature is embedded not in all devices running off Feature Pack 1. View Image – serves for calling up a list of thumbnails of pictures found in the current page, at that each image can be vied separately and then saved. Fields filler. The browser has also received “fields filler”, which does a lot of good when you submit addresses or fill in forms regularly. Password manager. For some pages you can take advantage of saving login and password to have these fields filled in automatically next time and thus make handling free mail accounts a breeze. Save pages for offline-browsing. 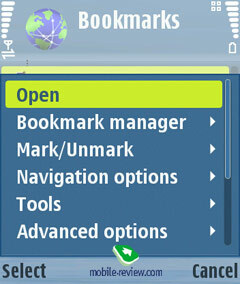 The Bookmarks folder holds a special item for saved pages inside, where you can browse saved pages in offline mode from. What does make us satisfied is that saving a page doesn’t take all the time of the world and texts don’t get corrupted. Yet images get saved only occasionally, which makes the pages look somewhat crude and surely different from the originals. Perhaps, the developers have deliberately cut this feature off, as otherwise small pages would have taken up about 200-300 Kb, which is quite much for a mobile device. RSS. In addition to RSS 1.0 and 2.0 the browser now boasts support for Atom channels, allowing you to set update time for all channels, so that you won’t have to worry about retrieving required feeds on time. But it would be even better to have individual settings and update schedules for each channel. While on a page, the OSS browser automatically detects available channels and offers you to subscribe. 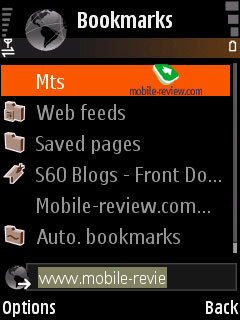 On top of that you can browse uploaded channels in offline mode. We have stumbled upon the issue of crude RSS 2.0 detection, when channels didn’t get identified automatically –download manager kept getting activated instead. Restarting the browser solved this problem for some time. Flash. The OSS browser carries support for FlashLite 2.0 onboard, which is one of the highlights of FeaturePack 1 and seemingly one of the reasons why this browser hasn’t been adapted for usage with older devices. Send a link. Previously you could share a link only via a text message, but now it is no longer a limitation – Bluetooth and other connectivity means of your device are at your disposal. The browser proves to be quite speedy, at that all pages appear on the screen without having any notable flaws, navigation won’t bring about any problems either. The second edition of the browser is more stable as well, which is all thanks to different file cache management (another advantage of running on Feature Pack 1). Unlike the first version, big and lengthy pages are handled in a more convenient fashion – number of errors is quite tiny. Those who accept no compromises and want to see their favorite web-page in their mobile devices in the same way as they appear on their desktop PCs, this browser is the best pick. They have spent a lot of time fixing the errors, so that the OSS Browser ver 2.0 easily comes out on top in the competition with Opera 8.60, lacking only page scaling feature and customizable shortcuts. Some shortcomings will be marked by pragmatics, though, specifically the fact that all pages are loaded from start to end, meaning that your data connection counter will rocket up. However this is all about the way this browser is built, as unlike Opera Mini it doesn’t sport a dedicated server scaling pages to fit the device’s display resolution, boosting upload speed and lowering traffic figures. On the other hand, it won’t be too long before the necessity in such conversions become nearly useless.